It is very nice to be in a cool place. This whole area does not look typically local. But it is definitely Malaysian. Tell us where this is. 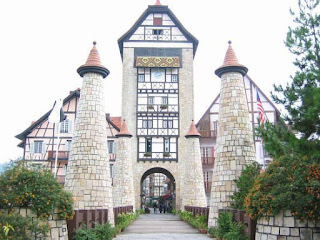 Its Berjaya Colmar Resort in bukit Tinggi,a copy of a similar named village in France. Parking is underneath all that structure, and theres entrance fee charged . 100% correct Azhar. Sounds like you've been there. Inspired by the original Colmar Village in Alsace, France,Colmar Tropicale is a picture postcard come alive! At its heart is Colmar Square, a cobblestone central courtyard where you can enjoy outdoor dining and street performances. Sounds like Johnny's been there too. might be nice to go, husni, but i can think of a lot of other places nearer and takes much less travel time.. these places i feel can be just as exciting. one of favorites is hussein sup.. i wonder who else knows about it. yeah...u r right..its not kinda place that i like to go..